A couple more food grades this week. First up: The rice cooker. Countertop appliances must earn a place in my kitchen. Even pots and pans beyond the basic array are subject to extreme scrutiny. Space and funds are limited, cooking habits rule; behaviors of high frequency do not require new equipment; minor adaptations for one-offs are encouraged. Specialized items must top a pretty high bar. The rice cooker wasn’t even under consideration. But the hubs saw a category review on America’s Test Kitchen and got it in his head. . . I listened, nodded, and waited. The interest did not pass or even fade. The arguments presented were reasonable. The dogs eat a lot of rice; we should/could eat more rice. Yes, the dogs were the turning point. Dear Liza was a chubby puppy before she came to us. Her weight and exercise levels are now in the healthy range, but she maintains her exceptional food motivation. Adding rice to her dinner fills her up efficiently. Naturally Iko expects rice too; animals understand food equality. So every week we made two batches of rice in the microwave. Efficient but noisy and a little messy, and more time than I’d like to devote to the task. However overall much less muss and fuss than the stovetop method. The result was a steady diet of rice for the dogs but none for us; it rather lost its appeal. 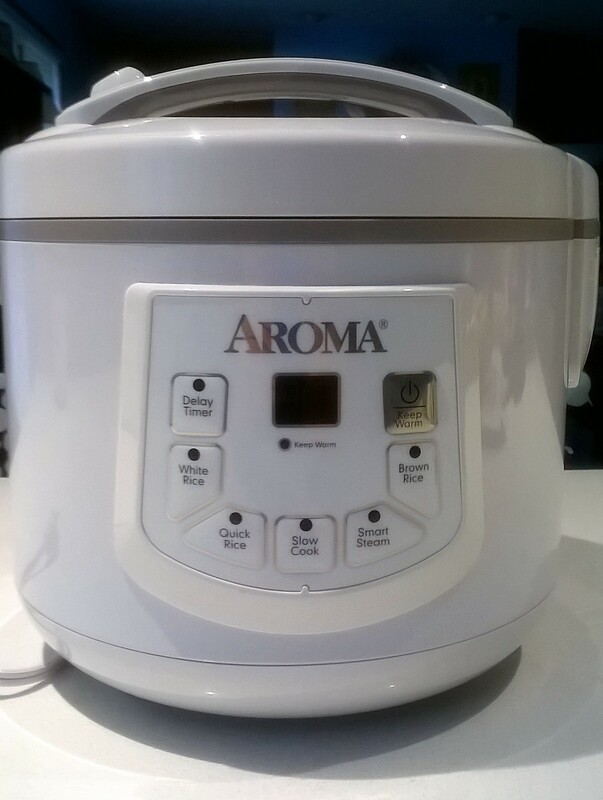 The hubs extolled the virtues, ease, and low price of a rice cooker. For 30 bucks at Target, meh, give it a try. The ease of filler ‘er up (a week’s worth in one batch), push a button, and walk away was admittedly appealing. We still haven’t made much rice for us. In time, perhaps. When not in use, it’s stored in the basement and presence is practically everything. Oh, and the stars aligned on this right before the hubs marked another trip around the sun. Happy Birthday, dear! Shall I put a bow on it?